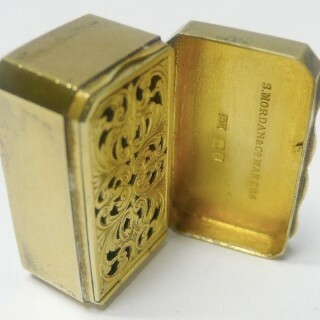 An excellent quality Victorian sterling silver and gilt vinaigrette with hinged lid and decorative inner pierced grill. Lovely crisp condition. The inset tortoiseshell top has intricate silver pique work with ribbons, swags and musical instruments. 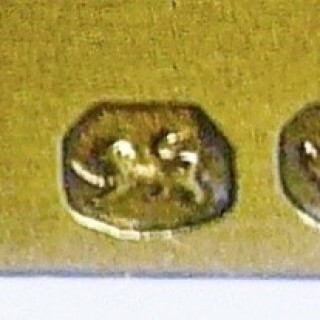 Weight 23 grams, under 1 troy ounce. Height 1.5 cms. Top measures 2.5 x 2 cms. London 1861. Maker Sampson Mordan, one of the most important makers of the period. Sampson Mordan (1770-1843), apprenticed to the mechanic John Bramah, established his own business in 1815. The first patent for a propelling pencil was obtained in 1822 (his co-inventor was John Isaac Hawkins). 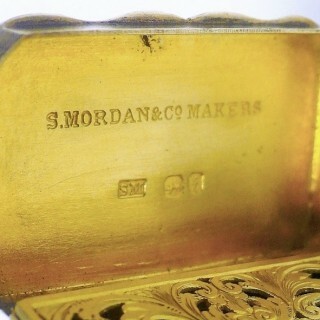 In 1823 Mordan bought out the rights of Hawkins, and entered into partnership with Gabriel Riddle manufacturing silver mechanical pencils with the marking “SMGR” until 1836 when the partnership was dissolved and the business became S. Mordan & Co. Sampson Mordan died in 1843 and the business was taken over by his sons Sampson (Jr) and Augustus who were later joined by Edmund George Johnson and Zachariah Watkins who retired in 1879. In 1898 the company was converted to a limited liability company under the name of S. Mordan & Co Ltd. In 1933 the distribution rights on the propelling pencil business were given to L. G. Sloan Ltd, and in 1941, following the destruction of the factory by enemy bombing, the patents were sold to Edward Baker. 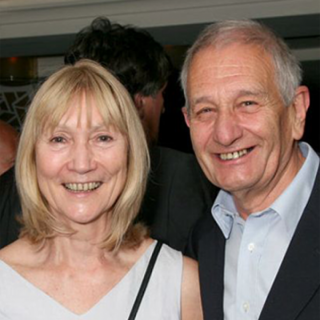 The firm went into voluntary liquidation in 1952. 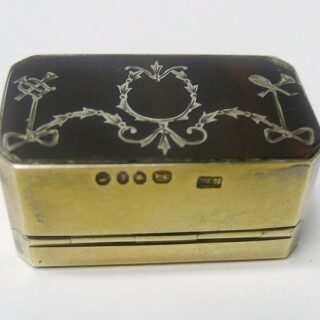 In addition to pencils the firm had a large production line of small silver and gold items, most of them belonging to the type of “novelties” so popular at the end of the 19th/beginning of the 20th century. 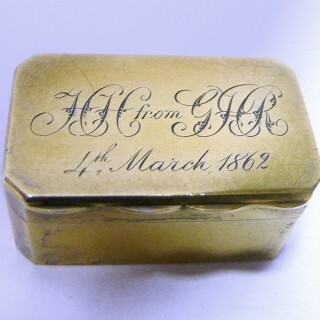 They were supplied to many retailers, including Asprey & Sons and the Goldsmiths & Silversmiths Co. Ltd. Sampson Mordan & Co was present at the 1851 London Great Exhibition and at the 1922 and 1929 British Industries Fair. 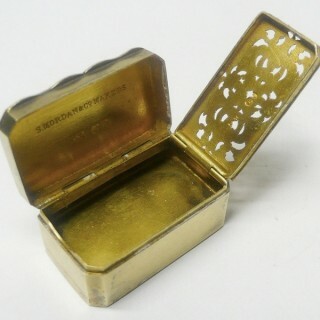 Vinaigrettes, popular from the late 18th century through the end of the 19th century, were small containers used for holding various aromatic substances, usually dissolved in vinegar. A tiny piece of sponge, soaked in the liquid, was contained beneath a grill or perforated cover. 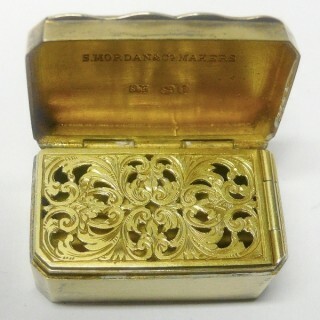 Ladies used to carry a vinaigrette with them to combat the aroma from the waste products common in cities. Likewise, the practice of wearing tight corsets also regularly caused woman to faint, requiring the need to carry smelling salts. 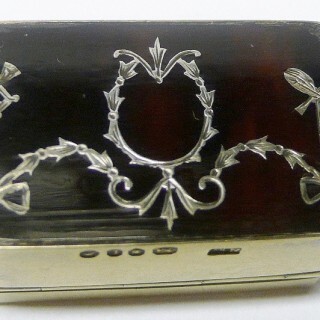 This beautiful silver vinaigrette is in good condition with no damage or restoration. Lovely crisp finish. 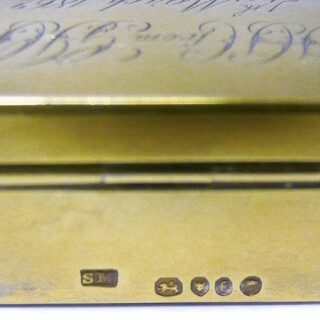 Marked inside the top and on the edge of the base with English silver hallmarks. The silver pique work is perfect. There is a slight frittiness to the outside corners of the tortoiseshell where it has been fitted into the mount.